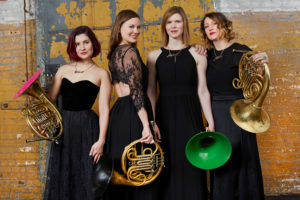 Genghis Barbie, the leading post post-feminist feminist all-female horn experience, is the most innovative and energizing chamber ensemble of its generation and beyond. With a combined 24 years of conservatory training, Genghis Barbie delivers to you a visceral and unadulterated musical adventure. Performing arrangements of pop music from all eras, contemporary commissions, and classical works, they are the most versatile and expansive group on NYC’s classical/pop/rock/jazz/indie/alternative/punk/electro-acoustic scene. Genghis Barbie was incepted in a unique moment of ingenuity when Freedom Barbie, Alpine Barbie, Velvet Barbie, and Attila the Horn converged and vowed to create distinctive, interactive and personal performances. Balancing individual musical careers in addition to their busy New York City performing schedule, the ladies of Genghis Barbie have performed at multiple International Horn Society Symposiums, premiered a solo commission at Carnegie Hall’s Stern Auditorium, and appeared on America’s Got Talent. Recently, their recording of “Take on Me” was featured in an episode of the HBO show “The Leftovers.” As educators, they have toured numerous universities presenting workshops, masterclasses, and lectures on musical entrepreneurship. They have released four studio albums: the self-titled debut album, the holiday album “Genghis Barbie: Home for the Holidays,” “Genghis Baby: Songs for Noa,” and their second pop album, “Amp it Up!”, and there upcoming release “2 Legit 2 Quit” will be available July 2019. Sheet music of their exciting arrangements is now available on their website, GenghisBarbie.com.